Programmerne afvikles let og styringen er egnet til installationer, hvor brugeren ikke skal have kendskab til DMX. 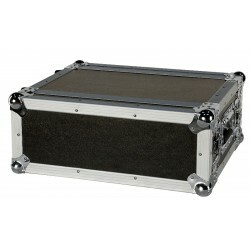 Smart The DR Pro Rack is a useful tool to store DMX values of complete Scenes, Chases or Shows. The total record time is 5 hours shared over the 8 memories. The basic functions are easy to control with the direct playback buttons at the front which makes it ideal for non-technical users. The unit can be locked with a password.